Advantages: Good photography; technical drawings; covers all variants; designed with modellers in mind. 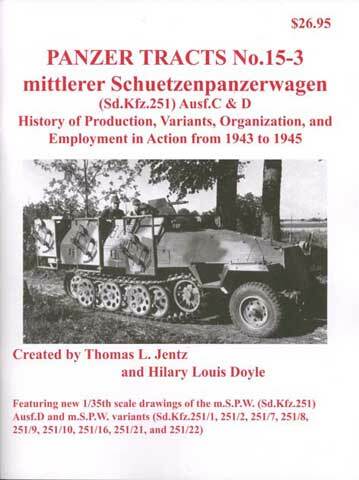 This is the Panzer Tract for modellers of all the late Sd.Kfz.251 kits now on the market! It has all the technical details,14 1/35 scale 4-view plans, chassis plans for 1943 and 1944 production with their different bump stop arrangements and armour body plans for Ausfs C and D.
As well as these, there are 1/20 scale detail drawings for the four types of track link, the several types of MG34 and 42 mounting and their different shields, the 8-tonne pioneer bridges, both types of short 7.5 cm gun with their mounts, the 3.7 cm “doorknocker” fitted to platoon leaders’ vehicles, flamethrower barrels, and the triple MG151 mount of the 251/21, and many smaller details. The detailed text covers all the subtypes and gives production figures, unit organisations, and experience reports, and there are many good, clear photographs. Another essential reference from the Panzer Tracts team.